Have your Google Analytics referral reports been filled with irrelevant spammy-looking sites? This is the place to find information about it and see ways to approach the issue. The first type of spam are actual bots that "visit" your site and make Google Analytics count the referral information. The second type - ghost referrer spam, is bots that bypass your site and hit the GA servers directly. No traffic on your site, but Google Analytics counts sessions and pageviews. Hence the "ghost" name. These two types of Google Analytics spam appear the same in your reports, but the approaches to blocking them can be different. To the right you can see a not so uncommon example of a spam-infested source/medium report. Why does it happen and can it hurt my site? The main goal of the spammers is to make you click the links to their site (or copy/paste it in your browser). Then they either offer some shoddy service or you'll end up on a malware-infested page, which is why it's best NOT to visit spammer sites. There is no direct harm to your site, aside from the minor amounts of traffic that the bot variety will incur on your server. Despite what some SEOs might claim, this type of spam has no effect on Google rankings whatsoever. 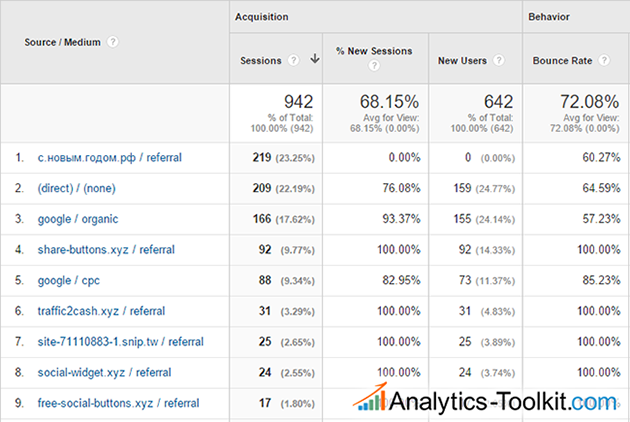 However, it is obvious that such traffic can impact your ability to gather insights from Google Analytics. The polluted statistics from the spam traffic are not limited to the source/medium report, since these sessions are treated as legitimate traffic and the spam traffic stats like bounce rate, session duration, pageviews per session, conversion rates etc. will be impacted. How can I stop or block referrer spam? If you manage a couple of sites only you can try and monitor for bot referral spam and then block it on the server level. However, this will not stop ghost referral spam from getting in your Google Analytics reports. The recommended way is to setup view filters in Google Analytics - include filter for the valid hostnames and an exclude filter based on the Campaign Source dimensions filtering out spammer domains. This is the easiest and most scalable solution (scalable to an extent). Web agencies with multiple clients would be happy to learn that we have a fully-automated, set-and-forget solution called Auto Spam Filters that has a 14-day free trial for 3 websites. Google Analytics Refferer Spam - Solved! Google Analytics Spam and What To Do About It? * since these are subject to daily change, we look at Google Analytics spam activity for the past couple of weeks. This is by no means a comprehensive list and may not be up to date.